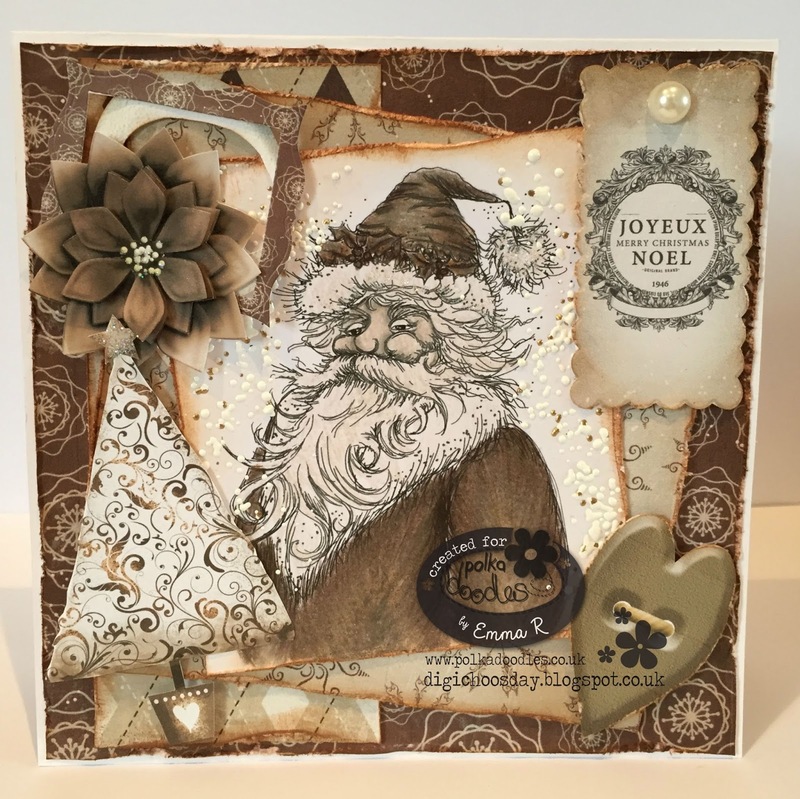 That means we want you to use something that is new to you, it could be a new image you recently bought, a new paper pack, some new embellishments etc. and the winners will be announced on 20th October 2015. 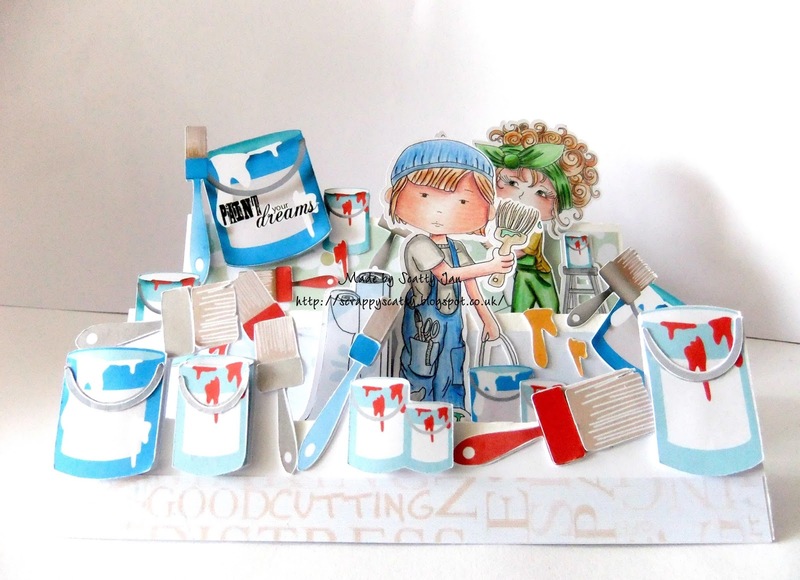 Emma - For my Something New I have made a stepper card & for me this is a very new sort of card for me. I have used Octavia Frosted Spines & Octavia Wandering Star who can be found as individual digi's Here & Here. I have coloured both up using Copic's & I have used some of the new pens that I have recently bought. 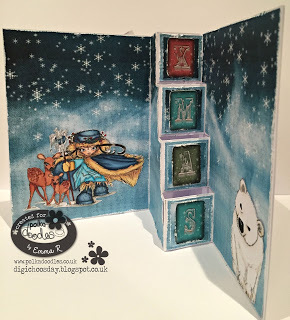 All of the papers & embellishments are from the New Frosted Winter Collection Here where you can also find both of the images I have used along with the Polar Bear. Julie -- New, new, and new! Lots of "new" for me today. Isn't new grand?!? I'm using papers and an image from the newly released Autumn/Halloween collections at Polkadoodles. The image is from the Autumn/Fall 2015 digi download bundle (mono). The colored version is available here. 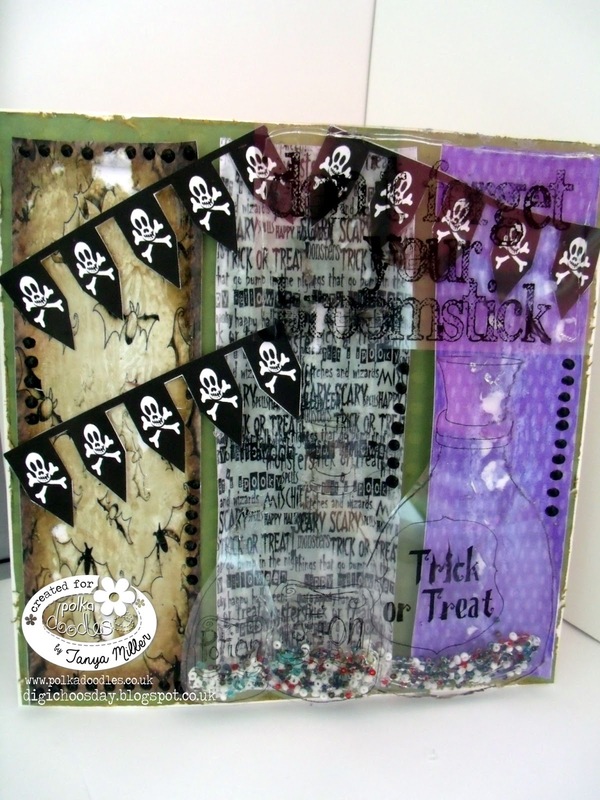 The papers are all from the Halloween/Autumn Paper Heaven 1 & 2 Digital Downloads. 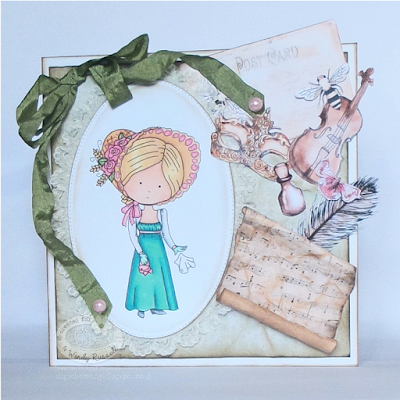 The sentiment is from the Twiggy and Toots Digital Download or CD Rom Paper Crafting Collection. I'm also using newly purchased dies, and NEW Lyra Rembrandt Polycolor Pencils. 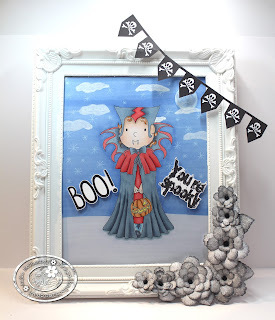 Anjie - I have used the new Spooky Dracula image and sentiments. I have coloured the image and background with my Graph'It Markers. I have put the image in a new picture frame I picked up last week. We are having a Halloween party at our house this year so this will go on the wall as part of the decorations. Monica- For my carousel card, I used a new collection Picknix 3 Nordic Winter, all papers, digis and words and swirls cutting files I used are from that collection. I also used a new laminator machine and a technique: foiling digis. I love how this foiling digis turn out. I’m back into the swing of crafting and creating since my holiday and this week have been playing with the ever so brand new Spooky Sentiments Bundle and the Halloween/Autumn Paper Heaven 1 Bundle to make this week's card on a Halloween grungy theme. Full details on my blog. Audrey used a number of NEW items this time around. First of all, my image Oddella Bow is new for me as I just got this image. I colored her with my brand new pencils - not only have I not used these pencils before, I have never colored a full image with pencils before, so this was very new to me. Finally, I made a new variation of a fold I have used in the past by altering the shape of the cut out in the middle. 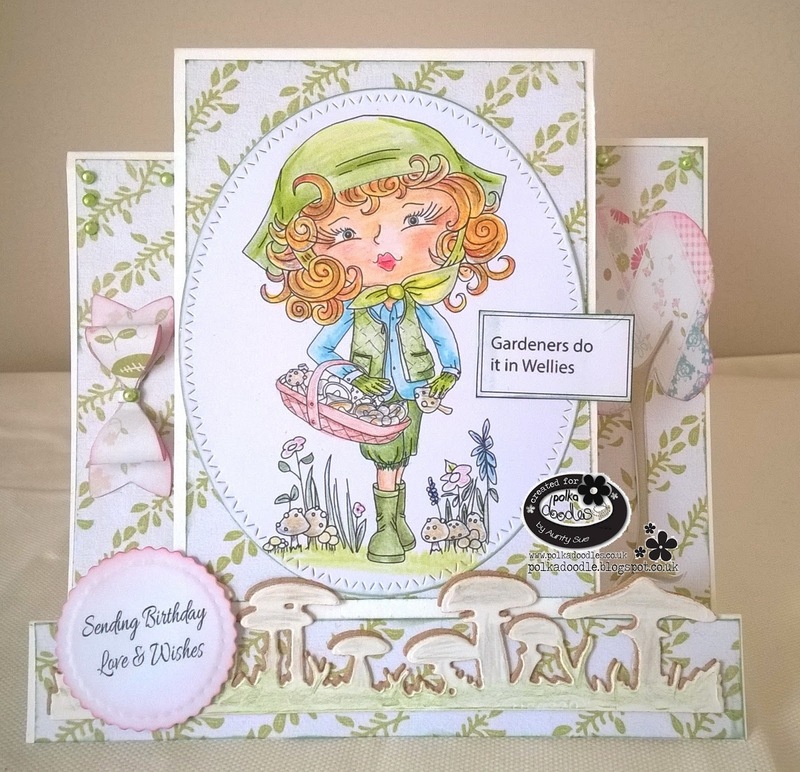 Additional items used on my card are hearts from the Winston Deluxe Full Collection and the mushroom embellie is from Twiggy and Toots Digital Papercraft Collection and can also be found in the Twiggy and Toots Embellies Bundle. Finally, my papers are from the girls papers found in the Work and Play 11 Digital Collection. Aunty Sue - Well what else could I show you other than the amazing new CD Octivia Frosted Winter. How ever my new thing is the technique Altering this frame. I have used Chalk paint doing several layers and then rubbing Copper Gliding Wax on the raised edges to give a old feel. This was a very cheap white plastic frame. 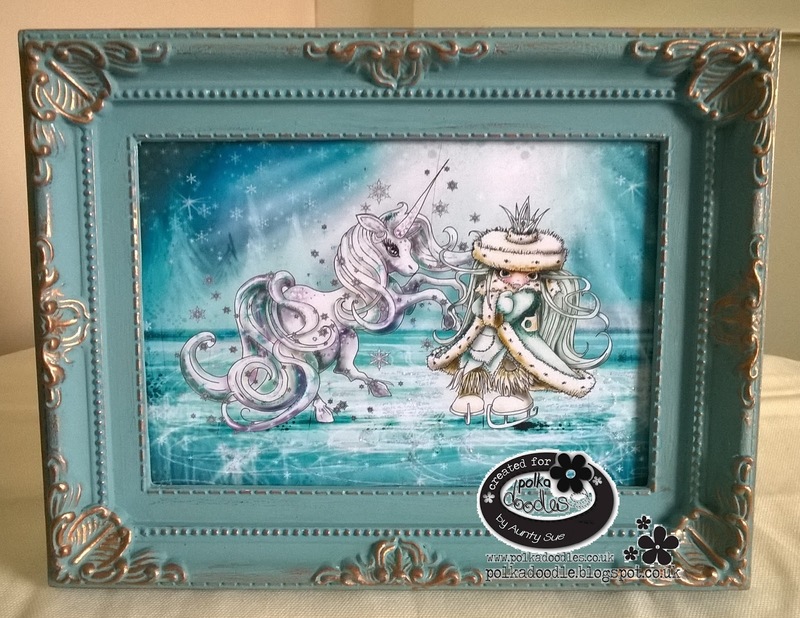 All this is to enhance this wonderful scene that I printed from the CD which you can purchase from the store HERE called Ice Queen & Unicorn. 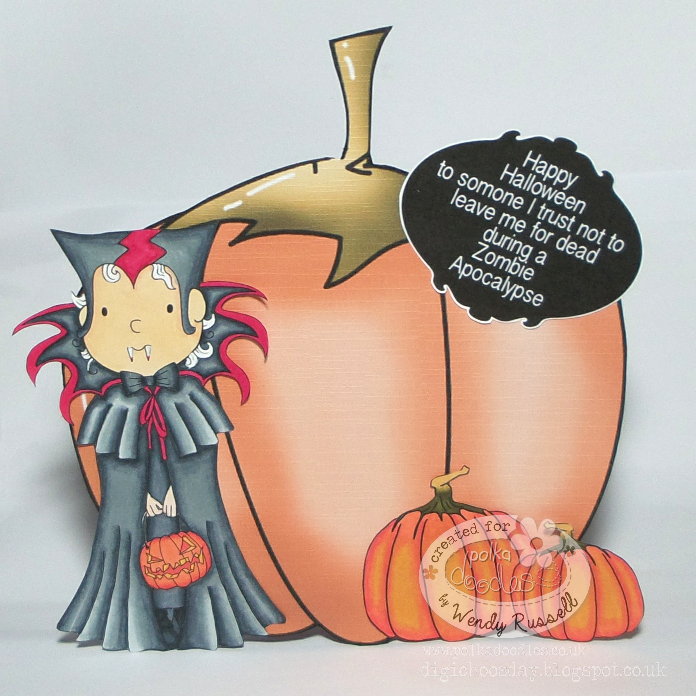 Wendy - For my pumpkin shaped card, I've used a pumpkin from the NEW Autumn 2015 collection, the image is the NEW Spooky Dracula and the small pumpkins and the sentiment are from the NEW 2015 Spooky Sentiments bundle. Please email us at sales@polkadoodles.co.uk quoting DCW036001 to claim your prize of £5 worth of downloads from the digi store! Yay, it’s Digi Choosday! That means it’s DISCOUNT DAY!!!! So we want to see lush ribbon and/or lace on your projects. It can be real ribbon and lace (if you can bare to use it) or it can be faux ribbon and lace. In the Polkadoodles collections you will always find lots and lots of faux ribbon that always looks real on your makes. and the winners will be announced on 13th October 2015. 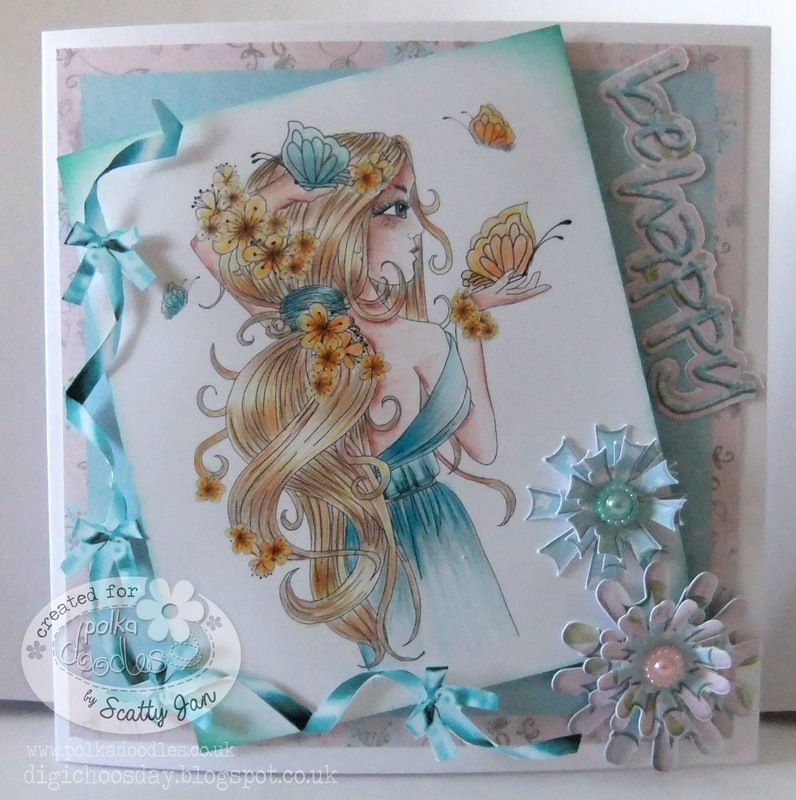 Scatty Jan I used the lovely Eden collection this time , colouring up the stunning Eden Blossoms I used my Lyra Rembrandt Polycolour Pencils. You can also get Eden Blossoms as a single digi here. The flowers, sentiment an adorable matching papers are all from the collection and also the lovely paper ribbon which I popped into Craft Artist and simply coloured it to match. Anjie - I have used real ribbon and faux ribbon to fit in with the theme. The image, papers, embellies and sentiment are all from the fabulous new Octavia Frosted Winter collection. This is available as a download collection HERE, as a CD HERE, or in separate items HERE. I have coloured her with my Graph'It Markers. The background is also done with Graph'Its and a the Graph'It blender pen and the Graph'It white shaker pen. 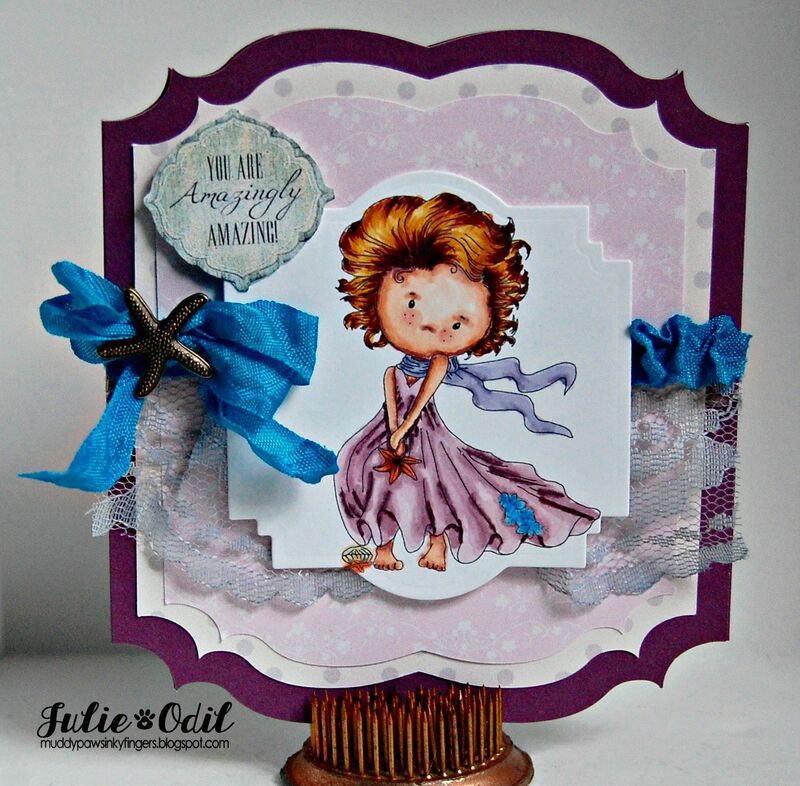 Julie -- ribbon and lace -- two of my favorite embellishments! 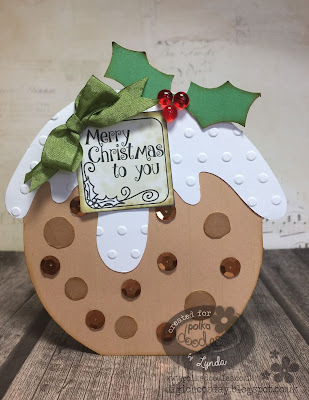 I used the Work & Play 5, Festive Hollybobs Digital Craft Download collection. You can get the Presents image individually here. The papers and sentiment are from the same collection. She is colored with Copic markers, and ready to wrap those Christmas presents. Now, if only I was as organized! 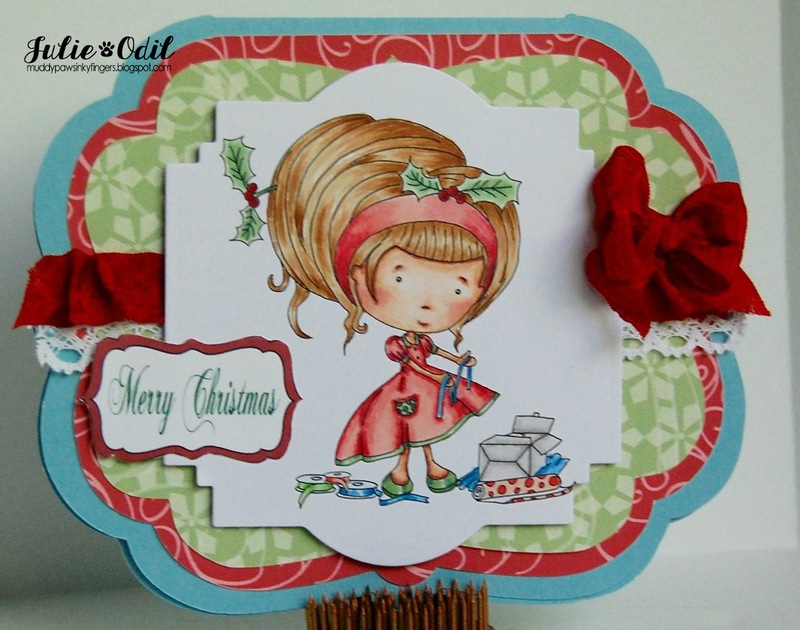 Emma - For my Ribbon & Lace card I have stuck with Christmas as I really need to get these Christmas cards done this year. 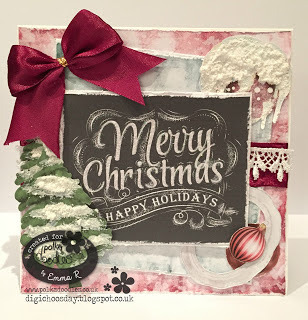 I have used one of the chalkboard sentiments from the Frosted Winter Collection as the main focus so no image from me today. 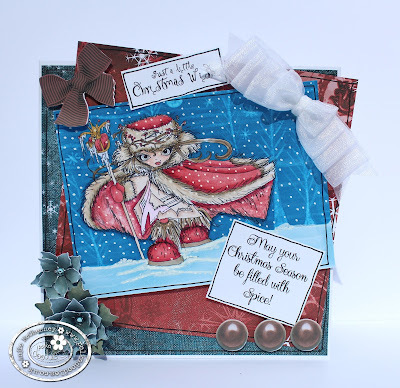 All of the papers & embellishments are also from the Frosted Winter Collection that can be found Here. 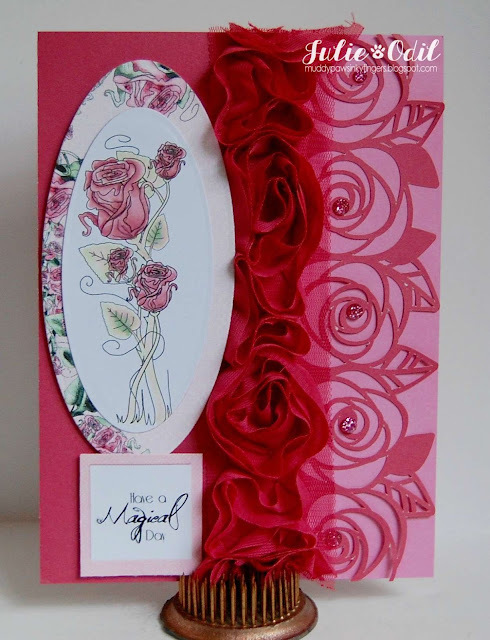 Monica.-For this challenge, I´m working with papers and rolled roses from Rose Budd Craft Download Collection. 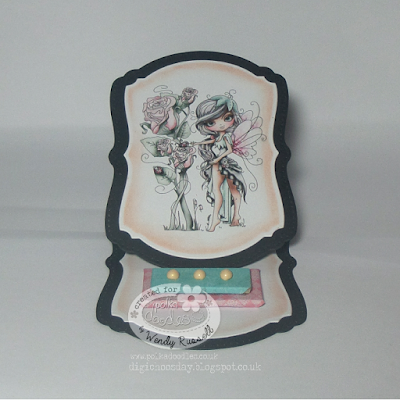 When I started making my card, I was going to add a hand coloured digi and rolled roses on a side. But then I rolled the roses and they were so gorgeous, that I chose to make them the focal point on my card. To achieve challenge requeriments, I used a slot ribbon border and added a piece of a beautiful and quirky brown lace under the roses. Hello folks. I'm fresh back from my holidays and although I've blogged while I've been absent and joined in the challenges it's good to get back into the swing of things with lovely ribbon and lace. 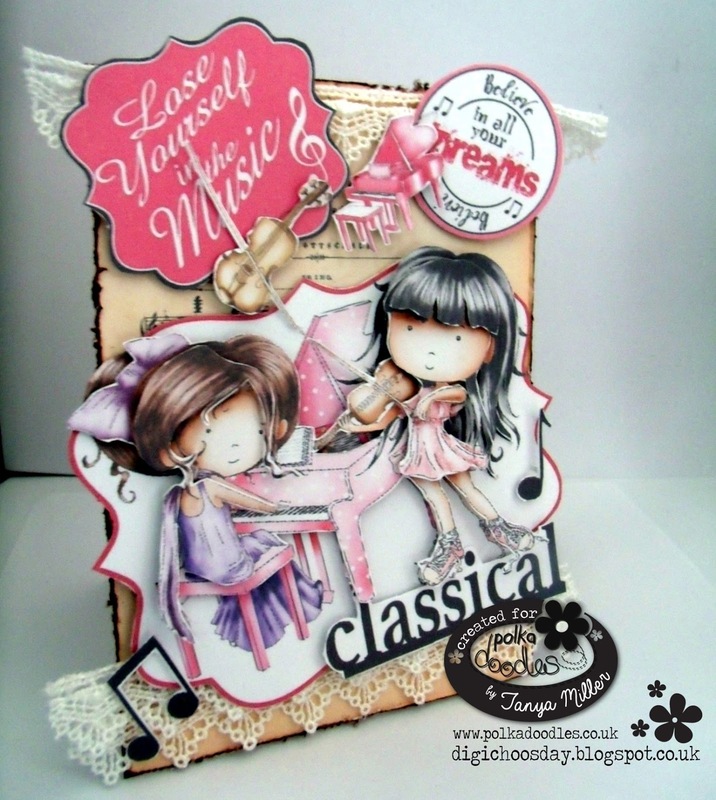 I've made a card using one of the design sheets from the Work & Play Music 8 Collection and just added some lace to the card and a touch of ink around the edges of the background. The design sheets show just how versatile they are and what can be done with them. Audrey created an altered notebook this time around using a technique called Faux Mosaic. I chose an image and sentiment, as well as some papers from Serenity Fairy Wishes Bundle. Image Serenity Blossom can also be purchased as a single digi HERE and you may also purchase all the sentiments in the Serenity Fairy Wishes Sentimentals Bundle. 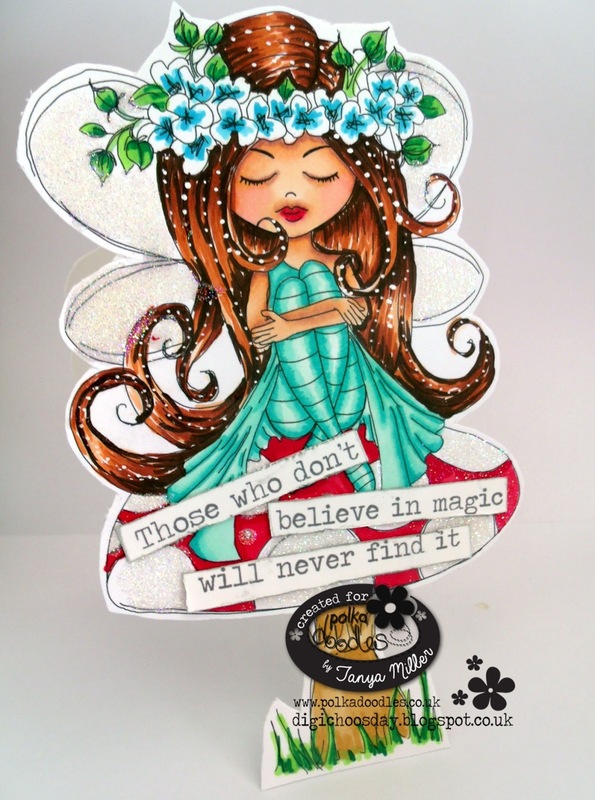 The other papers used are from the Winston Deluxe Full Collection and the butterfly embellies are from Twiggy and Toots Digital Papercraft Collection and can also be found in the Twiggy and Toots Embellies Bundle. Image and sentiment are cut with dies, I added an acetate piece over the sentiment, printed the same as the piece underneath, so that it makes it stand out more against the background. 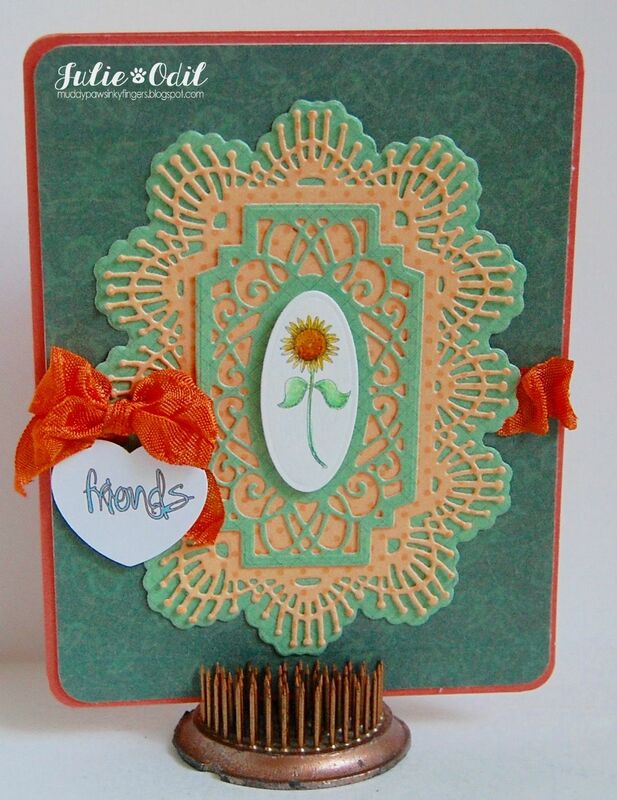 I added ribbon and lace from my stash on the spiral binding. 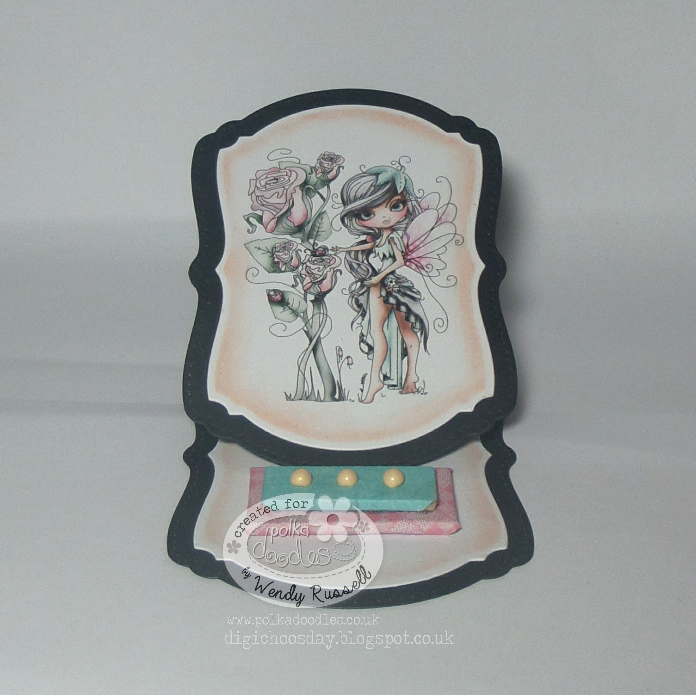 Wendy - I've used Constance from the Rose Budd Collection this week. The backing paper is from the same collection, as are all the embellies, including the mini manuscript, which come on one single printable design sheet. Aunty Sue- Well for my card this week I decided that as Strictly Come Dancing is starting on Friday. Toots should enter. So I have used Dancing Queen from the original Twigg & Toots available as a digi image here or you can buy the full download/ cd coloured with my Lyra Rembandt Polycolor Pencils. 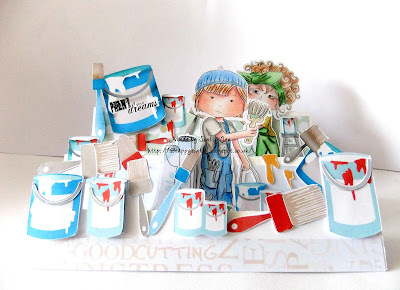 I have also used one of the many fab papers from the CD too. The sentiment is from another CD Serenity Fairy Wishes. I have used lots of glitter , gems as a dancing queen needs some sparkle. Please email us at sales@polkadoodles.co.uk quoting DCW035001 to claim your prize of £5 worth of downloads from the digi store! 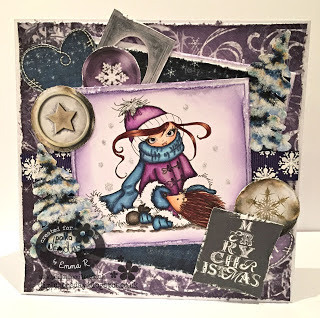 Before we get onto this weeks challenge we need to let you know that our fabulous Nikky Hall is on Create and Craft TV again this week. You can find her on there on Friday the 18th at 10am for an amazing show all about Coloured Pencils!!! She will be bringing you something new which will include a free class with it. Tune in to find out what it is! Just enter the code in the shop HERE ! So we want to see makes that use the same colour family this week - this doesnt have to be just black and white, it can be different shades of the same colour. You can use other colours for hair and skin etc, but the main focus needs to be shades of one colour please. and the winners will be announced on 6th October 2015. So let’s see what the design team have made for us! Scatty Jan I love the Work and Play 11 so much . This time I have used the Gymnast twirling girl available as a digi or part of the amazing CD collection . The paper and sentiment are also from the collection. I have coloured up with pencils. Punched a few flowers out and added some gems and a feather. Some stickles on her twirler to finish. Julie - I used shades of pink on my monochromatic make, and the rose image from the Octavia Moonfly Big Kahuna Digital Craft Download Bundle. The backing papers and sentiment are also from this lovely collection. Shades of pink -- so pretty! Aunty Sue - Hi wow have I loved doing this card. 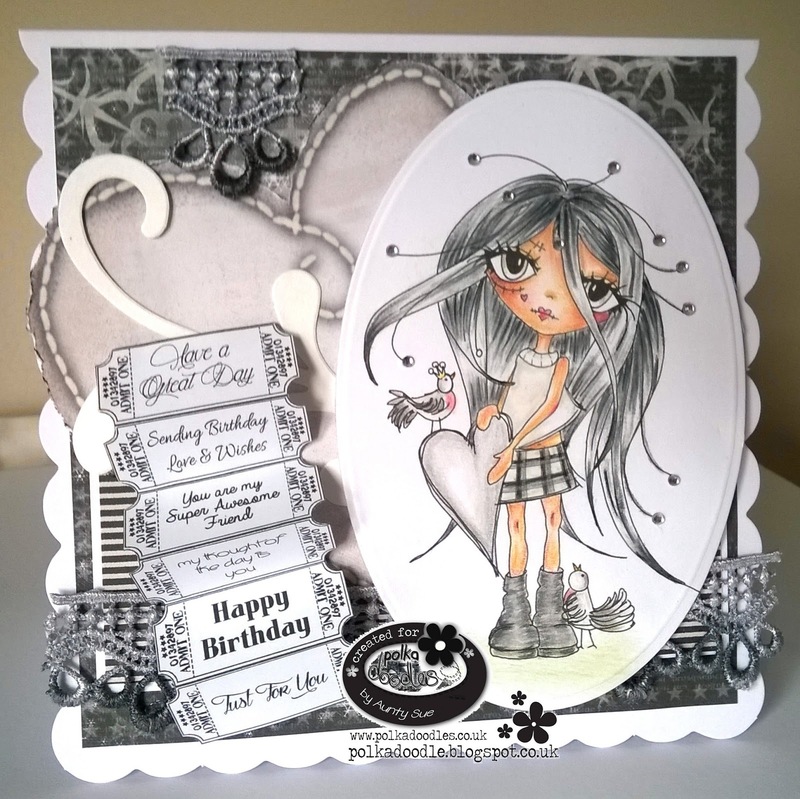 For my Monochromatic card I have gone with the Greys. 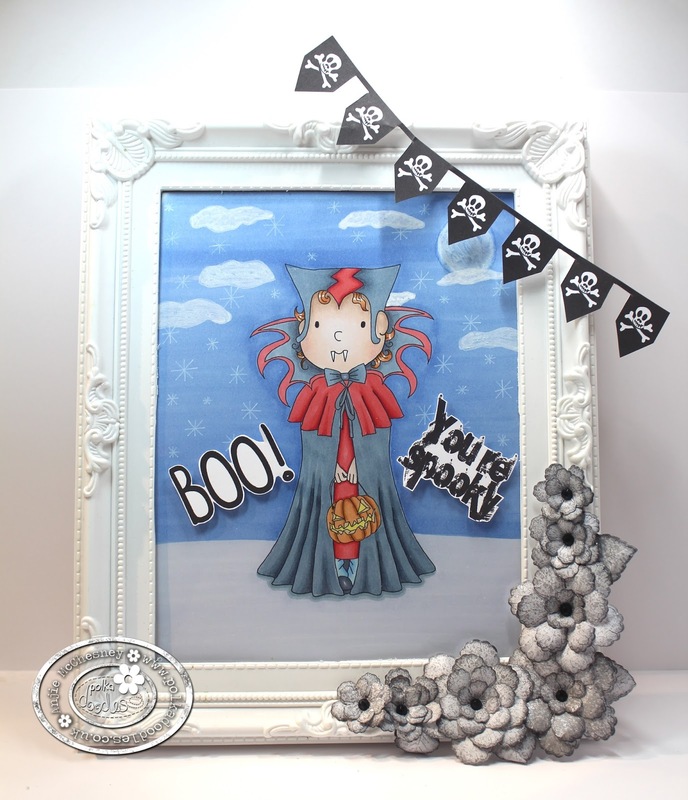 I have used yet again one of the fab Ickyink digi images. This one is Oddella Heart and is available HERE. 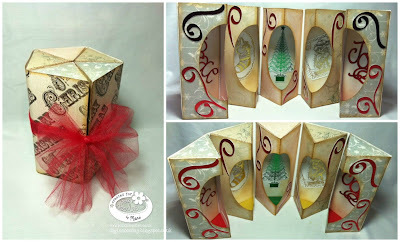 My papers and elements are from Frosted Winter CD available HERE My sentiment tickets are from Work & Play 10 Country Life available HERE. 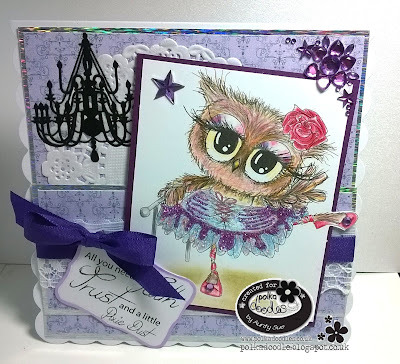 I have coloured my image with my new Lyra Rembrandt Polycolour Pencils and added lace and gems from my stash. Monica.-For my monochromatic project I made a double lever card with the gorgeous a papers and sentiments included on Love & Cherish Collection. I also used a flourish cutting file from Eden Collection and butteflies cutting file from Twiggy & Toots Collection. Anjie - The image, papers, embellies and sentiment are all from the fabulous new Octavia Frosted Winter collection. This is available as a download collection HERE, as a CD HERE, or in separate items HERE. As you can see I have used shades of green. I have coloured her with my green and grey green Graph'It Markers. The background is also done with Graph'Its and a the Graph'It blender pen and the Graph'It white shaker pen. Wendy - For my monochrome card I've used Etty Shy from the Winston collection. You can also get Etty as an individual digi here. 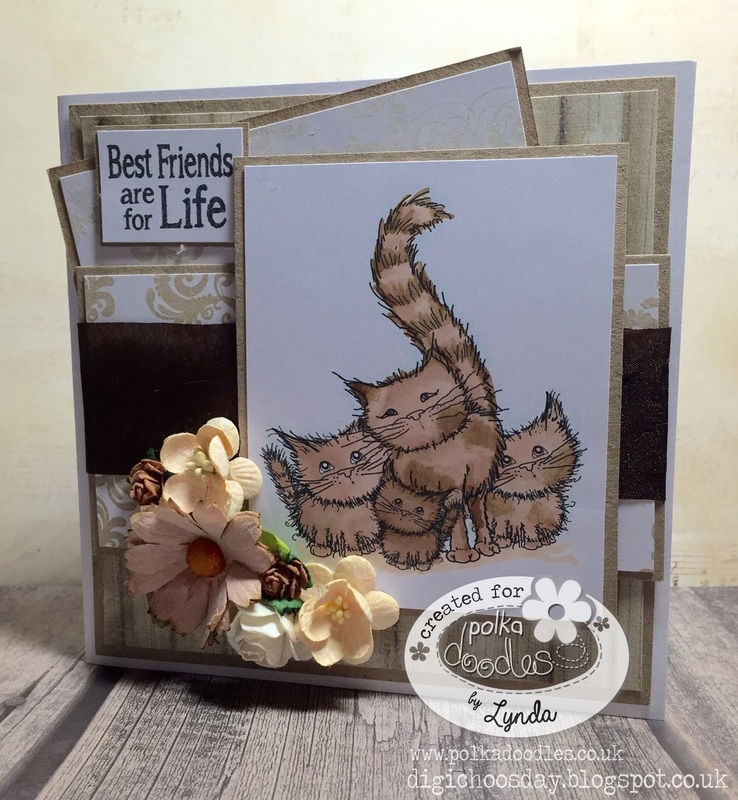 Both the dotty and striped backing papers are from the same collection, however I have darkened the dotty paper with Walnut Stain Distress Ink. Audrey I chose blue, using an image and sentiment from Serenity Fairy Wishes Digital Download Bundle. 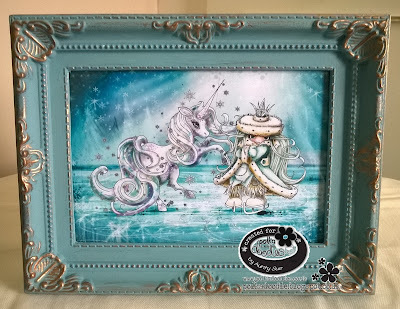 The image Serenity Earth Star, can be purchased as a single image HERE and you can also purchase Serenity Fairy Wishes Sentimentals Bundle on its own. All the designer papers I chose plus the flowers and button embellies can be found in the Winston Deluxe Full Collection. I then added the ribbon to the outside of the card and Stickles on Serenity's wings. GOOD GOLLY MISS MOLLY - DID THE TEAM ROCK THIS CHALLENGE OR WHAT???? I CAN'T STOP LOOKING AT SOME OF THESE MAKES THEYRE SO PRIDDEEEEE! So come on, add your entry using the linky tool below. Well done! Please email us at sales@polkadoodles.co.uk quoting DCW034001 to claim your prize of £5 worth of downloads from the digi store! Well done everyone, way to go! 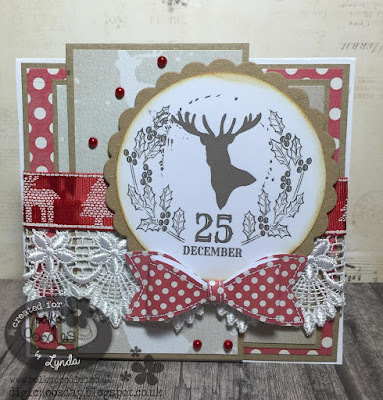 Make sure you tune in to Create and Craft TV today at 10.00 am to see our lovely Nikky with some fabulous inspiration, samples and ideas! You can enter any project which uses a shape which is not a square! 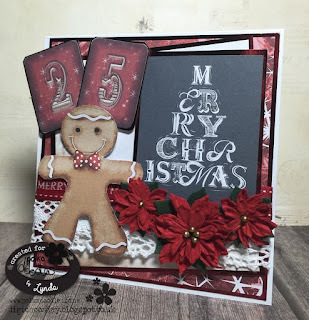 Your actual card can be square but we'd like to see you using some different mat and layer shapes where possible - with a little artistic licence of course! and the winners will be announced on 29th September 2015. The winner and top 3 for week 33 can be found at the bottom of this post. Anjie - I have used a TL die to create the shape of the card. The papers, embellies and sentiment are all from the fab Home For Christmas collection. There are some truly stunning papers on this CD. The image, Ralph, is coloured with my Graph'It Markers and I have given him some texture with the Mix It Fluid and some velvet ribbon. More photos and details on my blog. Julie -- I absolutely LOVE shaped cards, so this was such a fun challenge for me! I used one of the great shaped cards found in the Polkadoodles store. 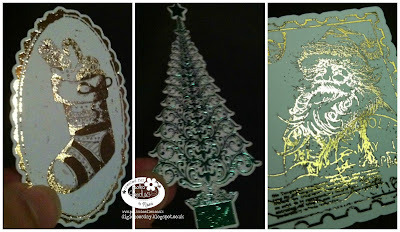 This is Elegant Card 2 SVG Cutting File, cut out on my Silhouette. The image is Seashore Shannon, colored with Copic markers. I used papers from the Kath Walking the Dog Digital Download. The sentiment is from the Twiggy and Toots Digital Download Collection. Hi, my shaped card this week is made from a Christmas Pudding cut file found on the Twiggy and Toots Festive fun collection. It's available on a CD or as a digital download. I embossed the icing and added some gems for the berries, finishing it off by using a sentiment from this collection. Have fun! Monica.-My project for this funny challenge is a tree shaped card made with trees, papers, elements and digi from Twiggy & Toots regular collection. Audrey I chose to do an Igloo for my shaped card. 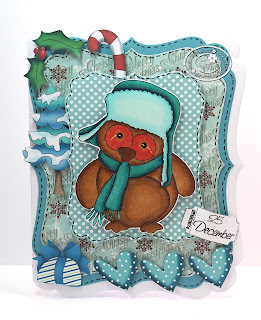 I used the precolored Igloo from Octavia Frosted Winter Digital Download Collection. I combined the 2 igloos using Gimp, flipping the 2nd one so they were back to back and joined them together so when I cut them out they would be attached in the center. I then cut them out with scissors and added Stickles. 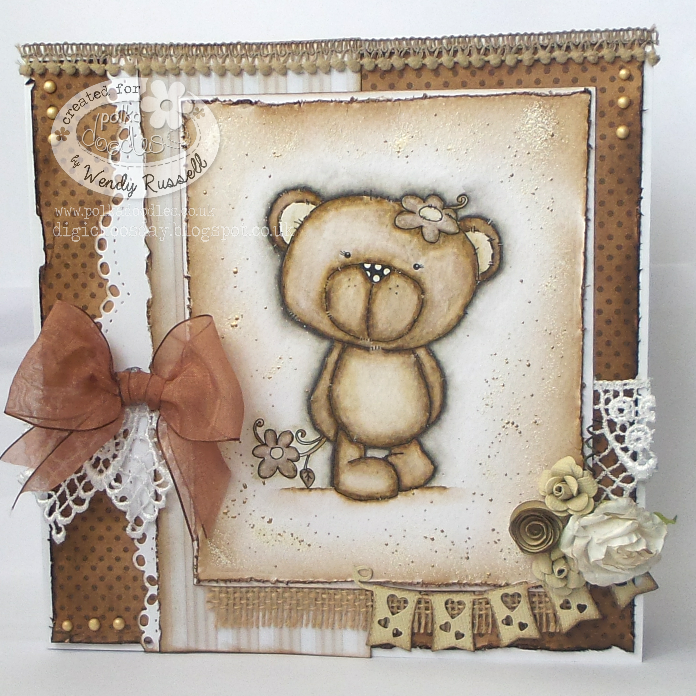 I chose papers, sentiment, heart and flowers also from Octavia Frosted Winter Digital Download Collection. Papers,heart and flowers are cut with scissors, I added the sentiment to the paper using Word and cut with Sue Wilson die. I chose my image Hot Chocolate from Octavia Frosted Winter Digital Download Collection as well, and you can also find her as a single image HERE. She is colored with Copics, cut out with scissors and Stickles added. 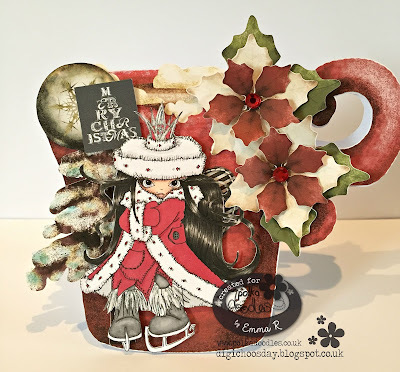 Aunty Sue- For my Shaped Card I have gone with a Stepper Card. I have chosen this fab image from the CD Work & Play 10 Country Life available here she is called Foraging Mushrooms and you can buy her on her own here The papers are from this Cd and also the Tree and Bow and Sentiments. I have colored her with my new Lyra Rembrandt Pencils. Dies i have used are Die-namics and Joy with a few pearls as accents. 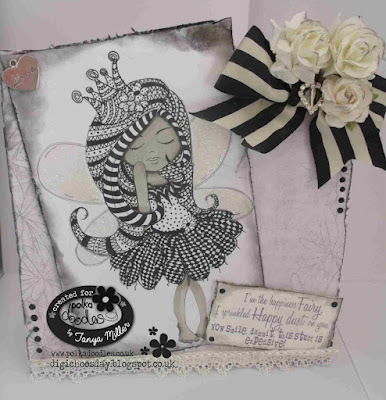 Wendy - I've chosen this week to use one of the pre-coloured images from Octavia Moonfly, just as a reminder you don't always need to hand colour if you don't have time! However, if you do have time to colour, the digi stanp of Octavia Rose Garden is also available on her own here. The backing paper on the mounted tiles are also from the same collection. Please email us at sales@polkadoodles.co.uk quoting DCW033001 to claim your prize of £5 worth of downloads from the digi store!